Open Season, an English movie, is not currently screening in Hyderabad. maybe you might have thought differently had it preceeded over the hedge. but yeah, all in all, it was enjoyable and elicite the correct responses in the correct areas. 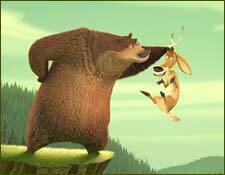 Open Season would be far from the first animated film tackling the subject of domesticated animals returning to the wild, and if the recent spate of assembly-line animated movies are anything to go by, hardly the last. The film is a funny, yet repetitive romp through the wild, and a promising debut from Sony's newly setup animation division. fullhyd.com has 700,000+ monthly visits. Tell Hyderabad what you feel about Open Season, and then also see all user reviews for Open Season!